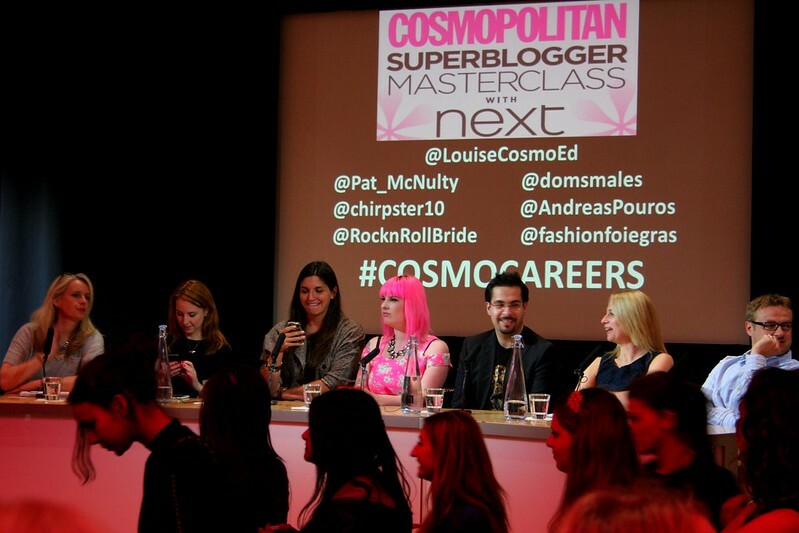 Last Tuesday I headed down to London with a friend to attend the Super Blogger Masterclass organized by Cosmopolitan Magazine. It was a very full day, starting with a half day at work, a train trip down to London and a Museum visit before we headed to the British Library Conference Center to attend the main event of the day. 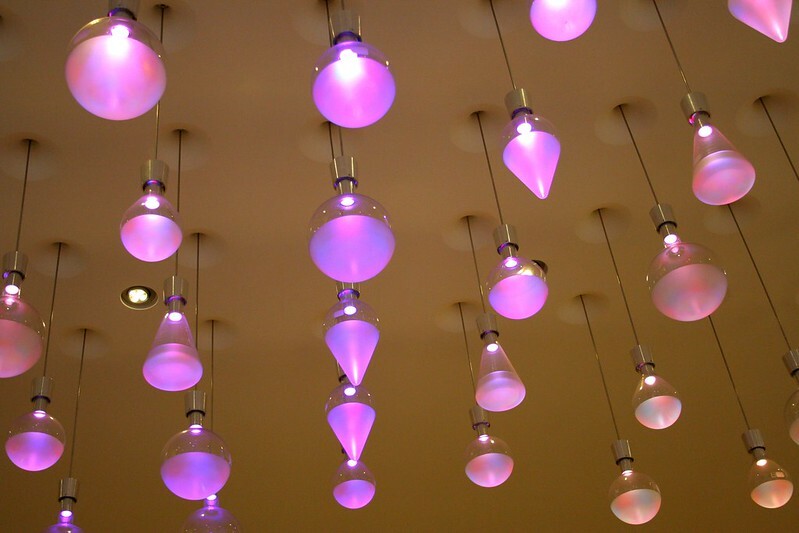 As soon as we arrived at King’s Cross, we headed to the Wellcome Trust, to see what was going on there. We ended up seeing a wonderful exhibition: Souzou – Outsider Art from Japan. Outsider Art is the English equivalent to Art Brut, a genre made by people outside of the established art world – often institutionalized or children. I was unable to take photos of the exhibition but I can tell you that it was extremely inspiring. You can find more details here. I decided I should wear something comfortable for the day and I didn’t regret it – I knew I’d be walking for a bit and that the weather wasn’t going to be forgiving so layering was necessary. It would appear that Spring only lasted for 2 days and I spent them in bed recovering from the op! 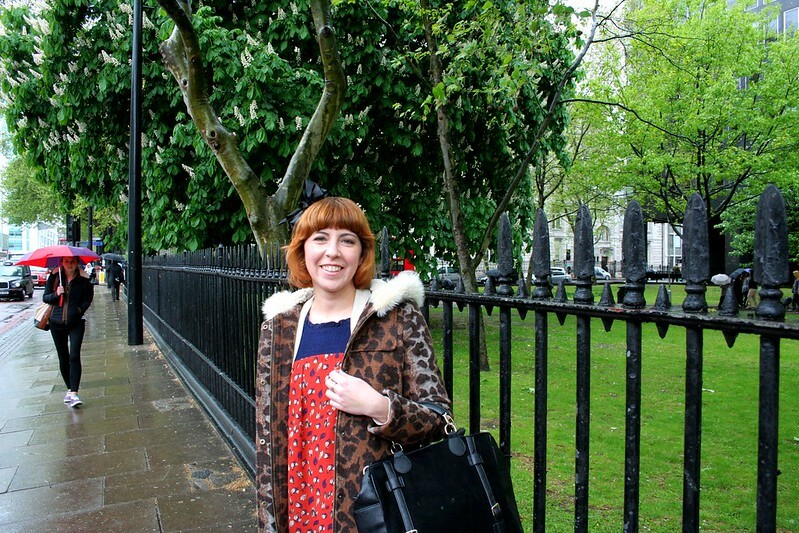 Now, for the details – Dress– Suncoo, Bag – I don’t remember, both via TK Maxx, Leopard Coat – Topshop, Gold Shoes – Office, both via Ebay, Cardigan – Vintage, Headband – H&M, Plastic Bag – I bought what seems to be an interesting book on Outsider Art at the museum. There were around 200 people attending the event. There was a good mix of ages and most likely types of blogs too. I wasn’t the oldest person on there, these events sometimes make me feel old. The panel. You can find more details on the speakers on the Cosmopolitan website here. I have to say I enjoyed the event a lot. It’s always good when you learn new things that you can apply as well as confirm a few things I am doing right. Of course there’s also things that I am doing wrong but I’ve been polishing them out little by little, or so I hope. 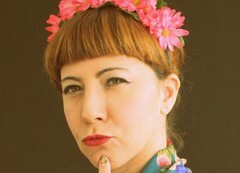 In the end I got to say hello to Kat Williams of Rock ‘n’ roll Bride as well as Andreas Poulos and Dom Smales. All very nice and available people. As one of the things we were told is very healthy to do is to collaborate with other bloggers and create a community, so I am linking this up to Patti’s Visible Monday. I love outsider art – sometimes more than insider art. You look gorgeous, and I’m glad to see you back on your feet. 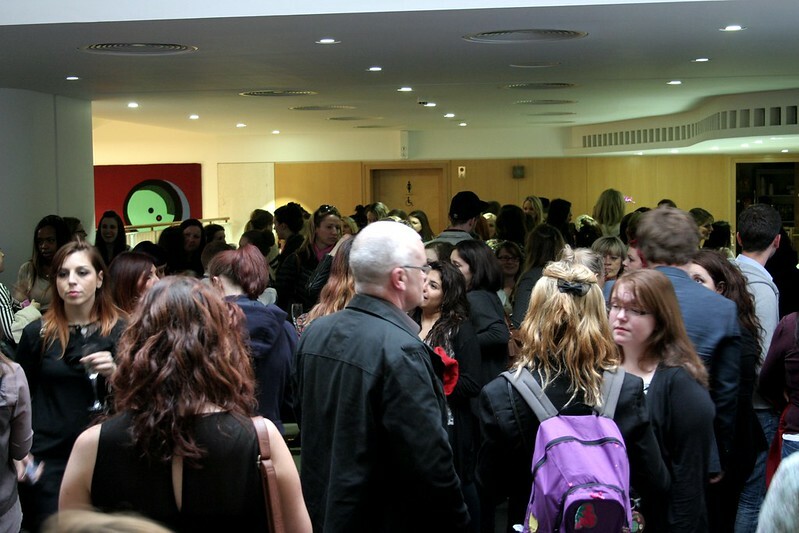 The Cosmo event looks like a big success. I’m happy to say I’ll be a more regular visitor now that I have upgraded my browser. This sounds like it was a great event to attend. I’ve never been to a blogger event although I would love to. Seems that they just aren’t held here in Toronto. I like your outfit. Comfy and cute. Here’s hoping your weather smartens up soon! I would have loved to share this experience with you, so much Sara. You are dressed pretty, quirky and confortable, so PERFECT. I wanted to see Souzou but I haven’t got there yet, the Wellcome collection always has something great on. Love your coat! Oh you look so healthy. Yay! I would love to go to a blogging conference. So much to learn. I would definitely be the oldest there! glad you’ve enjoyed that event, it’s always interesting to meet with bloggers and have some new tips about blogging! You are certainly cheery for a not-so cheery day! You look adorable! Master Blogging? Sounds intriguing! Please share more! Great exhibition … did a little digging and found a link to more detail on it, if anyone is interested. What a cool conference … know you gained oodles of info and expertise. You’re already pretty great at it. And, your outfit is cute, casual and put together to have a whole day looking good. Lovely. 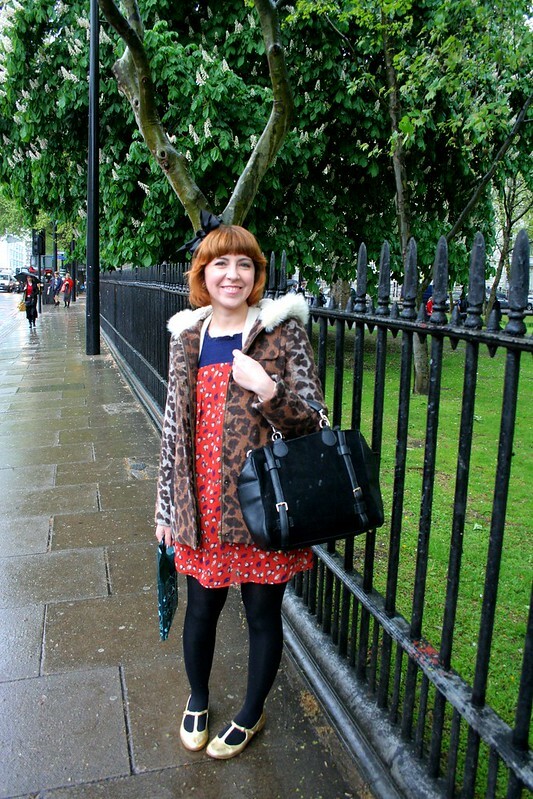 Lovely outfit, Sara – if you sometimes feel old at these blogger events, there’s no hope for me!